Surround sound is integral to the home theater experience. The following list spotlights the major surround sound formats in use. The formats are listed alphabetically, accompanied by a brief explanation, with a link out to full articles for detailed setup and technical details. What Is Surround Sound and How Do I Get? Audyssey DSX (Dynamic Surround Expansion) is a surround sound processing format that allows for the addition of front vertical-height speakers, but also incorporates the addition of left/right wide speakers positioned between the front left and right and surround left and right speakers. There is no content encoded with this format, instead, a home theater receiver that incorporates Audyssey DSX analyzes the embedded sound cues in a 2,5, or 7 channel soundtrack and expands the sound field to the specific speaker layout used. In the home theater surround sound timeline, Auro 3D Audio is the youngest format available to consumers but is the most complex to set up. Auro 3D Audio is a consumer version of the Barco Auro 11.1 channel surround sound system used in some commercial cinemas. In the home theater space, Auro 3D Audio is a competitor to the Dolby Atmos and DTS:X immersive surround sound formats. Auro 3D Audio starts with 5.1 channel speaker layer and subwoofer, then, just above that speaker layout (above the listening position) is another set of front and surround speakers (that means a two-layer speaker layout) - These are referred to a level 1 and level 2. Also, to get the full benefit of Audio 3D Audio, you need to include one ceiling mounted speaker that is placed directly above the listening position. This added option is referred to the as the VOG channel (Voice of God). The total number of speakers (not including the subwoofer) is 10. Auro 3D Audio is both a decoding and processing format. If a Blu-ray Disc or other compatible content source is encoded with Auro 3D audio, and your home theater receiver has the necessary decoder, it will distribute the sound as intended. However, the Auro 3D Audio system also includes an up mixer, so that you can get some of the benefits of Audio 3D Audio on standard 2, 5, and 7 channel content. Access to the Auro 3D Audio format is only available on select high-end home theater receivers and AV preamp processors. Dolby Atmos is a surround sound configuration introduced in 2012, initially as a commercial cinema sound format, that provides up to 64-channels of surround sound by combining front, side, rear, back, and overhead speakers. Dolby Atmos surround sound encoding format is designed to provide a completely immersive surround listening experience. Adapted for home theater use, Dolby Atmos is available on select Blu-ray and Ultra HD Blu-ray Disc releases, and provides several speaker setup options (depending on brand/model of the home theater receiver) that may require 7, 9, or 11 total channels (that is a lot fewer speakers than 64!). For the best results, it is encouraged that consumers employ ceiling mounted speakers for the height channels. However, Dolby, in partnership with several home theater makers have developed standards for vertically firing speakers that can be incorporated into both bookshelf and floor standing designs, or as separate modules that can be placed on top of the most current bookshelf or floor standing speakers. Dolby Digital is a digital encoding system for audio signals that can be decoded by a receiver or preamplifier with a Dolby Digital decoder. Dolby Digital is often referred to as a 5.1 channel surround system. However, it must be noted that term "Dolby Digital" refers to the digital encoding of the audio signal, not how many channels it has. In other words, Dolby Digital can be Monophonic, 2-channel, 4-channel, or 5.1 channels. However, in its most common applications, Dolby Digital 5.1 is often referred to as just Dolby Digital. Dolby Digital EX is based on the technology already developed for Dolby Digital 5.1. This process adds a third surround channel that is placed directly behind the listener. In other words, the listener has both a front center channel and, with Dolby Digital EX, a rear center channel. If you are losing count, the channels are labeled: Left Front, Center, Right Front, Surround Left, Surround Right, Subwoofer, with a Surround Back Center (6.1) or Surround Back Left and Surround Back Right (which would actually be a single channel - in terms of Dolby Digital EX decoding). This requires another amplifier and a special decoder in the A/V Surround Receiver. Dolby Digital Plus expands the Dolby Digital family up to 7.1 channels. This means that in addition to left and right surround speakers, it provides the ability to accommodate a pair of left and right surround back speakers. Dolby Digital and EX soundtracks are available on DVD, Blu-ray Discs, and some streaming content, while Dolby Digital Plus is available on Blu-ray and some streaming content. Dolby Pro Logic extracts a dedicated Center Channel and Rear Channel from two-channel content. The Center Channel more accurately centers the dialog (this necessitates a center channel speaker for full effect) in a movie soundtrack. Also, there is a rear channel, but although the rear surround channel employs two speakers, they are still passing a monophonic signal, limiting rear-to-front and side-to-front motion and sound placement cues. Dolby Pro Logic II is a surround sound processing technology, developed jointly by Jim Fosgate and Dolby Labs. Dolby Pro-Logic II technology can create a "simulated" 5.1 channel surround environment from any two-channel source (such as stereo CDs and Vinyl Records) as well as from a 4-Channel Dolby Surround signal. Although different that Dolby Digital 5.1 or DTS (discussed later in this list), in which each channel goes through its own encoding/decoding process, Pro Logic II makes effective use of matrix-ing to deliver an adequate 5.1 representation of a stereo film or music soundtrack. Dolby Pro Logic IIx is an enhancement to Dolby Pro-Logic II, that includes the addition of two back channels, in addition to Dolby Pro-logic II's 5.1 channels, thus making Dolby Pro-logic IIx a 7.1 channel surround processing system. Dolby Pro Logic IIz is a surround sound processing format that is a predecessor to Dolby Atmos. Unlike Dolby Atmos, content does not have to be specially encoded, which means that any 2, 5, or 7 channel sources can benefit. Dolby Pro Logic IIz offers the option of adding two more front speakers that are placed above the left and right main speakers. This feature adds a "vertical" or overhead component to the surround sound field (great for rain, helicopter, plane flyover effects). Dolby Prologic IIz can be added to either a 5.1 channel or 7.1 channel setup. Yamaha offers a similar technology on some of its home theater receivers referred to as Presence. Dolby TrueHD is a high definition digital-based surround sound encoding format that supports up to 8-channels of surround decoding and is bit-for-bit identical to a studio master recording. Dolby TrueHD is one of the several audio formats designed and employed in the Blu-ray Disc format, and, formerly in the now discontinued HD-DVD format. Dolby TrueHD is delivered from Blu-ray Disc or other compatible playback devices via the HDMI connection interface. Dolby Virtual Speaker is designed to create a fairly accurate surround experience that gives the illusion that you are listening to a complete surround speaker system but is utilizing just two speakers and a subwoofer. Dolby Virtual Speaker, when used with standard stereo sources, such as CD, creates a wider soundstage. However, when stereo sources are combined with Dolby Digital encoded DVDs are played, Dolby Virtual speaker creates a 5.1 channel sound image using technology that takes into account sound reflection and how humans hear sound in a natural environment, enabling the surround sound signal to be reproduced without needing five, six, or seven speakers. DTS is a 5.1 channel encoding and decoding surround sound format that is similar to Dolby Digital 5.1, but DTS uses less compression in the encoding process. As a result, many feel that DTS has a better result on the listening end. In addition, while Dolby Digital is mainly intended for the Movie Soundtrack experience, DTS is also being used in the mixing and reproduction of musical performances. To access DTS encoded information on CDs and DVDs, you must have a home theater receiver or preamplifier with a built-in DTS decoder, as well as a CD and/or DVD player with DTS pass-through. DTS 96/24 is not so much a separate surround sound format but is an "upscaled" version of DTS 5.1 that can be encoded onto DVDs. Instead of using the standard DTS 48kHz sampling rate, a 96kHz sampling rate is employed. Also, the standard 16-bit depth, the bit-depth is extended up to 24 bits. What all of the above jargon means is that there is more audio information embedded into the soundtrack, translating into more detail and dynamics when played back on 96/24 compatible devices, which includes most home theater receivers. Also, even if your source device or home theater receiver is not 96/24 compatible, that is not a problem as non-compatible devices can still access the 48kHz sampling rate and 16-bit depth that is present in the soundtrack. While Dolby Digital and DTS approach surround sound from a directional standpoint (specific sounds emanating from specific speakers), Circle Surround emphasizes sound immersion. A normal 5.1 source is encoded down to two channels, then re-decoded back into 5.1 channels and redistributed back to the 5 speakers (plus subwoofer) in such a way as to create a more immersive sound without losing the directional cues of the original 5.1 channel source material. Circle Surround provides enhancement of Dolby Digital and similar surround sound source material without degrading original intent of the surround sound mix. Circle Surround II adds an additional rear center channel, providing an anchor for sounds emanating from directly behind the listener. DTS-ES refers to two 6.1 channel surround encoding/decoding systems, DTS-ES Matrix and DTS-ES 6.1 Discrete. DTS-ES Matrix can create a center rear channel from existing DTS 5.1 encoded material, while DTS-ES 6.1 Discrete requires that the software being played already has a DTS-ES 6.1 Discrete soundtrack. DTS-ES and DTS-ES 6.1 Discrete formats are backward compatible with 5.1 channel DTS Receivers and DTS encoded DVDs. These formats are rarely used on DVDs and are almost non-existent on Blu-ray Discs. 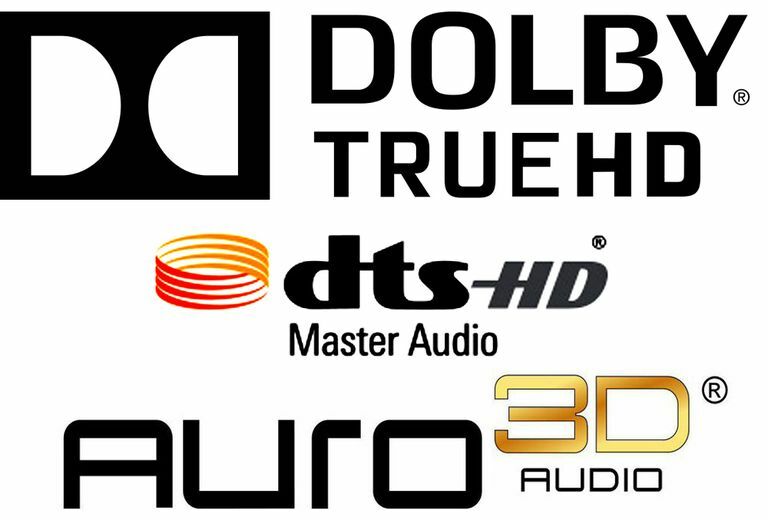 Similar to Dolby TrueHD, DTS-HD Master Audio is a high definition digital-based surround sound format that supports up to 8-channels of surround decoding with increased dynamic range, wider frequency response, and higher sampling rate than other standard DTS formats. DTS-HD Master Audio is one of the several audio formats designed and employed by Blu-ray Disc and the now discontinued HD-DVD format. To access DTS-HD Master Audio, it must be encoded onto a Blu-ray Disc or other compatible media format and delivered via the HDMI connection interface on a home theater receiver that has a built-in DTS-HD Master Audio surround sound decoder. DTS Neo:6 is a surround sound format that functions in a similar fashion to Dolby Prologic II and IIx (mentioned previously in this article). If you have a home theater receiver that includes DTS Neo:6 audio processing, it will extract a 6.1 channel (front, center, right, left surround, right surround, center back) field from existing analog two-channel material, such as a stereo CD, vinyl record, or stereo movie soundtrack or TV broadcast. Also, even though DTS Neo:6 is a six-channel system, the center back channel can be split between two speakers. DTS Neo:X was originally introduced by DTS as a counter to Dolby's ProLogic IIz and Audyssey's DSX surround sound formats. DTS Neo:X is an 11.1 channel surround sound format. This format does not require mixing soundtracks specifically for the 11.1 channel sound field. A DTS Neo:X processor is designed to look for cues already present in stereo, 5.1 or 7.1 channel soundtracks that may benefit from placement in an expanded sound field that includes front height and wide channels. DTS Neo:X can also be scaled to work within 9.1 or 7.1 channel environment, and you find some home theater receivers that feature DTS Neo:X incorporate the 7.1 or 9.1 channel options. In these types of setups, the extra channels are "folded" with the existing 9.1 or 7.1 channel layout, and also not as effective as the desired 11.1 channel setup, it does provide an expanded surround sound experience over a typical 5.1, 7.1, or 9.1 channel layout. DTS has retired on Neo:X on home theater receivers that are compatible with DTS:X surround format, which is discussed next. Developed in a parallel timeline, and featuring some similarity to Dolby Atmos, the DTS:X surround format is surround decoding format in which sound objects can be placed in a 3-Dimensional space, rather than just assigned to specific channels or speakers. Although DTS:X requires encoded content (Blu-ray or Ultra HD Blu-ray), it does not require a specific speaker layout, like Dolby Atmos. Although it can work fine with a Dolby Atmos speaker setup, and most home theater receivers that include Dolby Atmos, also include DTS:X (sometimes a firmware update is required). A properly-equipped home theater setup that features DTS:X audio decoding will map a decoded DTS:X signal to 2.1, 5.1, 7.1, or any one of several Dolby Atmos speaker setups. DTS Virtual:X is an innovative surround sound processing format that projects a height/overhead soundfield without the need to add extra speakers. Using complex algorithms, your ears are fooled into hearing height, overhead, and even rear surround sound. Although not as effective as having actual physical height speakers, it does cut down on speaker clutter. DTS Virtual:X can add height enhancement to both two-channel stereo and multi-channel surround sound source content. It is best suited for use in soundbars, where all the speakers are housed within a single cabinet. However, it can be applied in home theater receivers. What is Surround Sound and How Do I Get It? What Does DTS Mean And What Does It Have to Do With My Home Theater? Where's the Best Place for My Home Theater Speakers?